A cloud phone system is a fully functional telephone solution hosted entirely in the cloud, so no phone lines are required, just an internet connection. The phone numbers associated with a cloud phone system are not tied to an exchange, in layman’s terms this means your phone number is not tied to your physical location, like a plain old telephone number would be. Why would I want Magnet Voice’s Cloud Phone System? Many businesses feel like their clunky old phone system is holding them back but worry about the large up-front costs of upgrading their IT equipment. 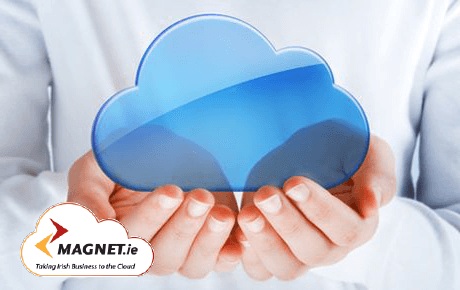 That’s not a problem with the Magnet Voice cloud phone system – because our system is entirely cloud-based you can leave the cost of infrastructure and maintenance to us. With your phone system in the cloud, you don’t need a telephone line anymore, only an internet connection. So, why are you still paying line rental? The system’s features are not just limited to desk phones; a company’s phone system can be accessed from a physical handset on their desk, a laptop through a soft phone on a PC and even on a smartphone or tablet thanks to Magnet’s unique smartphone app. Magnet Voice can allow businesses with multiple offices to manage their phones on a single system – allowing free calls between employees and completely removing the expense of inter-office calls. This makes Magnet Voice ideal for multi-location offices and remote users. Magnet Voice is effortlessly scalable; a business can increase or decrease its use of the system depending on its needs at any given time. You only pay for what you use in a system that can be scaled to suit all business needs – from the smallest start-ups to the biggest companies in Ireland. Magnet Voice numbers aren’t tied to an exchange either, so when your business grows you can bring your phone numbers to your new office location (or anywhere, in fact!). Through our innovative smartphone app you will never miss a call made to your office number. It gets all the calls your landline number is receiving and it allows you to make calls from your landline number on your mobile phone too. Of course the app has the full functionality of the phone system in your office: call transfers, use of extension numbers, listen to voicemails, call recording and much more. You can have multiple numbers directed to one phone; this means you are can be receiving calls to your 01 Dublin number and your 074 Donegal number right to your mobile while you’re working in Galway! As described earlier because the system is hosted in the cloud, your office phone number is available anywhere in the world via the smartphone app. The app connects to the office phone system so you can work as productively from home as you do in the office. The Magnet Voice system features a large array of advanced phone features such as automated attendant, call centre queuing and more. Click here for more information.